On the occasion on the 12th Anniversary of his Episcopal Ordination, H.L. Bishop Camillo Ballin MCCJ has presented to us his pastoral letter entitled Baptism | Confirmation. The purpose of this booklet is to help us to understand better the precious gifts of Baptism and of Confirmation and at the same time serve as a guide for priests and lay people who need to prepare families for Baptism and Confirmation. The letter explains that the sacraments of initiation—Baptism, Confirmation, and Holy Communion—are the three primary sacraments on which the rest of our life as a Christian depends. Originally tied very closely together, these three sacraments are now, in the Western Church, celebrated at different milestones in our spiritual lives. This year's (2016-2017) annual pastoral letter of H.L. Bishop Camillo Ballin, MCCJ entitled The Vigin Mary Our Mother comes to us on the occasion on the 11th Anniversary of his Episcopal Ordination. As in the year 2017 the Church will celebrate the 100th anniversary of the apparitions of the Virgin Mary to the three shepherd children of Fatima: Lucia, Jacinta and Francisco, Bishop Camillo has chosen to meditate on the Virgin Mary, as Mother of the Church and as our Mother. His intention, however, is not solely to speak on the message of Fatima but to reflect on the role of the Virgin Mary in the Church and in our life. This letter has three chapters: 1. The Doctrine of the Catholic Church on the Virgin Mary, 2. The Virgin Mary in the Liturgy, 3. The Rosary. Bishop Camillo, in his letter, has asked every parish priest, in communion with all his priests, to consecrate his parish, and the country where the parish is located, to the Immaculate Heart of Mary on Saturday, May 13, 2017: Memorial of Our Lady of Fatima. Undoubtedly, this consecration will have a tremendous influence on all the faithful. In his second letter this year, In the Vineyard of the Apostolic Vicariate of Northern Arabia: A Decade After, H.L. Bishop Camillo, MCCJ, shares his memories and aspirations of the last ten years (his first decade in office, as Bishop of our Vicariate). 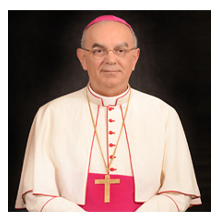 Bishop Camillo says, "After ten years of my Episcopal Ordination, I see in the future, a need to walk towards a new level of evangelical life in order to pass to a new and higher phase of Christianity more inspired and motivated by Jesus." It is with this aim in mind that he invites everyone to a deeper and more personal conversion to our Lord Jesus. 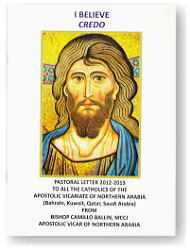 This year's (2015-2016) annual pastoral letter of H.L. Bishop Camillo Ballin, MCCJ entitled The Holy Year of Mercy comes to us on the occasion on the 10th Anniversary of his Episcopal Ordination. His Pastoral Letter explores the teaching of the Pope in the Bull of Indiction of the Year of Mercy by way of comments and relevant quotations from The Catechism of the Catholic Church. "This is the Holy Year of Mercy, a precious time to become more aware that God our Father is always filled with compassion for us and wants us to consider everybody not only as his sons and daughters but also as our brothers and sisters," says Bishop Camillo. This year's annual pastoral letter of H.L. Bishop Camillo Ballin, MCCJ comes to us on the occasion on the 9th Anniversary of his Episcopal Ordination. In his previous pastoral letter (YEAR OF THE CHURCH - PART I), Bishop Camillo presented the Church as our Mother. Then, he explained the meaning of “I believe in the Church” and also gave the list of the Eastern and Western Churches which form the Catholic Church, together with the list of the priests who minister in our Apostolic Vicariate of Northern Arabia as the concluding part of that pastoral letter. In this year's letter , he presents a deeper understanding of the Church by taking as guide The Catechism of the Catholic Church – Compendium (CCC-C) which has already been our book of meditation since last year. Taking that book again in our hands, and his quoting from its teachings in this letter, will be a more efficacious way to assimilate what God invites us to believe in about the Church. This pastoral letter of H.L. Bishop Camillo Ballin, MCCJ comes to us on the occasion of the 75th anniversary of the Sacred Heart Church in Bahrain, the first Catholic Church built in our Vicariate in 1939. It is but a fitting occasion to study, meditate and contemplate the mystery of the Church. The Year of the Church started on the 1st of December 2013, First Sunday of Advent, and will end on 23rd of 4th November 2014, the last Sunday of the Ordinary Time, solemnity of Our Lord Jesus Christ King of the Universe. A notable feature of the letter is the program outlined for the year, in which the Bishop has invited all the prayer groups to start their weekly meeting always with 20 minutes of special formation on the Church. The main sources for Reflection being the Catechism of the Catholic Church (CCC), the Compendium, the Youcat, and the Constitutions of Vatican Council II Lumen gentium and Gaudium et spes. This year's annual pastoral letter of H.L. Bishop Camillo Ballin, MCCJ comes to us while we are still in the Year of Faith proclaimed by His Holiness Pope Benedict XVI. In fact, the Year of Faith started on 11 October 2012 and will end on 24 November 2013, the Solemnity of Our Lord Jesus Christ, King of the Universe. "We need to be enlightened on our Faith," says Bishop Camillo in his letter. "To have faith means to give priority, in our requests, to what should be first: to ask the gift of the Holy Spirit, knowing that all the rest will be given us freely because God is our Father and he knows well what we need. However, we have to discern, through prayer what the plan of God is for us, what He wants us to do in our lives. This means to pray with faith and to live our life in faith." As an ideal example of a true faith, Bishop Camillo presents the catechesis of Pope Benedict XVI on St. Peter in the second section of his Pastoral Letter. In this year's Pastoral Letter, H.L. Bishop Camillo Ballin, MCCJ gives a detailed explanation of the Apostles’ Creed. The Creed, which we recite at Mass is a complete expression of our faith. Bishop Camillo says in the introduction, "When we say the Creed we do not just enumerate a list of truths but we enter into a dialogue with God, we abandon ourselves into the hands of a love which has its origin in God. It enables us to thank God who, in Jesus Christ, revealed himself to us and made us his adopted children so that we can call him 'Father'." This year's topic has been very aptly chosen in order to deepen our faith and commitment in this "Year of Faith" that His Holiness Pope Benedict XVI has declared from 11th October 2012 to the Solemnity of Our Lord Jesus Christ, Universal King, on 24th November 2013. As the Holy Father says, "We need to know our faith more exactly, "reinvigorate it, purify it, confirm it and confess it" (cf. Porta Fidei, 4). Thus, may this presentation of the Creed help our faith and strengthen us in confessing it with courage before any person we meet in our daily life. In his new Pastoral Letter, H.L. Bishop Camillo Ballin, MCCJ explains how "faith" and "works" are essential parts of Christian life, although they have different roles. "Our faith will be more authentic if it pushes us to pray, to remain in communion with God and to take care of the others. Otherwise our faith will be a dead one!" he says. He uses the writings of Paul and James as our guide. St. Paul stresses that the foundation of our salvation is the death of Jesus, not the laws of Moses only to combat the opinion of some people that circumcision and other "works of the law" were necessary for salvation. At the same time, Saint James stresses that Christians must put their faith into concrete action to combat the opinion that professing faith in God is enough for salvation. Bishop Camillo concludes his letter by saying that salvation ultimately comes from God and from Jesus Christ, not from us or anything that we do. But what is important is that all our works must come from an intimate, constant and strong communion with God, a fruit of our faith in Jesus Christ and of our love for him. The Lord's Day — as Sunday was called from Apostolic times — has always been given special attention in the history of the Church because Sunday recalls the day of Christ's Resurrection. Thus, it stands at the very heart of all worship. In his Pastoral Letter, "Dies Domini" which comes to us on the 5th anniversary of his Episcopal Ordination, H.L. Bishop Camillo reflects on the meaning and importance of Sunday and through it urges the faithful to rediscover the reasons for keeping the Lord's Day holy. Given its many meanings and aspects, and its link to the very foundations of the faith, the celebration of the Christian Sunday is an indispensable element of our Christian identity. H.L. Bishop Camillo's Pastoral Letter, "We Cannot Live Without the Eucharist!" comes to us on the 4th anniversary of his Episcopal Ordination. It is a cont- inuation of his previous two pastoral letters (released in 2007 and 2008). In this letter, the Bishop invites the faithful to contemplate and comprehend in a deeper way what the Eucharist is! The title of the pastoral letter which is a profession of the testimony of the martyrs: We cannot live without the Eucharist! 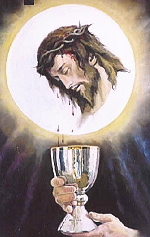 is a call to re-discover the beauty and the amazement of the Eucharist. The main section of the pastoral letter is written in the form of questions and answers, compiled from the numerous questions that the Bishop has received from the faithful and from the Compendium of the Catechism of the Catholic Church. Pastoral Letter: WE CANNOT LIVE WITHOUT THE EUCHARIST! H.L. Bishop Camillo's Second Pastoral Letter which was released on the third anniversary of his Episcopal Ordination is based on the Parts of the Holy Mass with a more detailed explanation of the Liturgy of the Eucharist. The title of the Letter has been taken from 1 Cor 10:17. St. Paul says: "And as there is one loaf, so we, although there are many of us, are one single body, for we all share in the one loaf." The Letter concludes with notes and indications on how to use the letter. H.L. Bishop Camillo's Pastoral Letter of this year is on the Eucharist. The title of the Letter has been taken from the Papal Encyclical Ecclesia de Eucharistia, in which thrice Pope John Paul II described the Eucharist as "amazement". The First Part of the Pastoral Letter explains in as simple terms as possible: the Biblical Roots of the Eucharistic Celebration, The Eucharist as a Sacrament of Unity, The Altar as Symbol of Christ and Music in the Liturgy. The Second Part of the Pastoral Letter closely examines the Liturgy of the Word. Each section of the Letter concludes with thought-provoking questions for a deeper understanding.